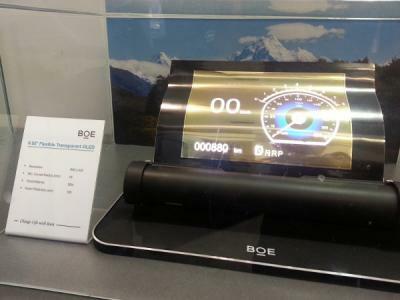 Back in 2014 we reported that BOE Display will build a Gen-6 LTPS AMOLED fab in Chengdu, China. The company started working on the new fab in May 2015, and said that the total investment will reach around $3.54 billion. Today BOE filed a statement today in which they confirm the new fab and disclose that it is going to produce flexible OLEDs. BOE announced an investment cooperation with the Chengdu Municipal Government, and discloses also that the fab will have two lines with a capacity of 24,000 monthly substrates for each line. The new fab is expected to begin mass production in 2017. BOE Display aimed to start mass producing AMOLED displays at 5.5-Gen LTPS OLED fab in Ordos in the second half of 2015, but the company is still struggling with low yields and is not ready to mass produce AMOLEDs yet. In May 2015, BOE demonstrated several new AMOLED prototypes - including a 9.55" 640x432 flexible transparent panel, a 4.8" 480x800 flexible AMOLED and regular glass-based 5" FHD and 13.3" WQHD (2560x1600) AMOLEDs. Besides the Ordos and Chengdu fabs, BOE is also planning a 8.5 OLED TV fab in Hefei Xinzhan, with an estimated investment of $1 billion. BOE already has a Gen-8.5 pilot line in place that was used to produce 55" 4K OLED panel prototypes demonstrated back in 2014.